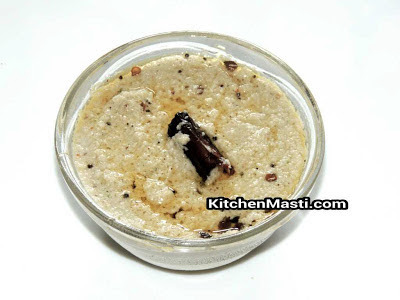 Coconut chutney can be rightly called as the King of Chutneys in India I think it is prepared in almost in everybody's house in the mornings.It goes on well with almost all types of dosas and idlis , kadabu,but then it has certain disadvantages also. This chutney cannot be preserved or kept for a long period of time because the coconuts tends to get stale very soon. Using coconut you can prepare different types of chutneys. It provides an immense source of energy. In countries like India, Sri Lanka and other South Asian countries, coconuts are used abundantly. Its one important feature is that it contains lauric acid which is found in mothers milk. It helps in digestion and has low glycemic index. measuring about 35 It stimulates insulin secretion and has many minerals and other nutrients. Above all , it does not contain any trans fats.And also , it helps in developing immune system. It roughly takes around fifteen minutes to prepare this chutney. First and foremost, take a mixer jar. Add coconut scrapings, green chillies, salt,a asafoetida and tamarind into the jar. Remove it from the jar and transfer it into a small bowl. Prepare the seasoning - Take a small pan. Add two tsp of coconut oil into it. Add broken red chillies, urad deal ( black gram), mustard seeds, curry leaves. Let it splutter and then add it to the coconut chutney bowl. People who suffer from acidity can follow the above step. Coriander leaves or pudina ( mint ) leaves can be added along with coconut while grinding. It will give you a different taste. Reduce the coconut scrapings and add a hand full of roasted chana dal while grinding. This is one more change in the coconut chutney and this will surely remind you about the coconut chutney served in the hotels and restaurants. One of the most important points to remember is that, as far as possible, always try to add some fresh coconut scrapings. Or else , you will get a stale taste. You can also, add one chopped onion while grinding the coconut. This will give you a onion flavor in the chutney.